Personal: Native of Quebec City, Quebec…Wichita State University graduate with degree in business administration. 2018: As defending champion, finished fourth in Xtra Frame Greater Jonesboro Open losing to Tom Daugherty in first stepladder match 193-168...Finished 10th in Roth/Holman Doubles with Stuart Williams. Career: In 2017 won Xtra Frame Greater Jonesboro Open by defeating Ryan Ciminelli 224-152 for third career Tour win. Won PBA Regional Challenge as part of WSOB IX by defeating AJ Johnson 247-235 in title match...Earned Harry Golden Rookie of the Year honors in 2016. Won Shark Championship for second Tour title by defeating Walter Ray Williams Jr. 204-196 in title match. Won 2016 U.S. Open for first Tour title defeating Marshall Kent 228-194 in championship match. Also beat Shawn Maldonado 300-211 in semifinal match to record 26th televised finals 300 game and sixth in a major...Joined Mika Koivuniemi (2001) as only international players to win U.S. Open. Finished third in 2016 Downums Waste Services Jonesboro Open. 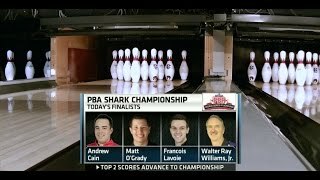 Finished fifth in 2016 PBA Fall Swing Wolf Open losing to Tom Daugherty 212-192 in first stepladder match (first PBA Tour national television appearance) and fifth in Badger Open losing to Jason Belmonte 226-225 in first stepladder match...Finished 13th in Chameleon Championship and 16th in World Championship in WSOB VIII...Finished sixth in 2015 USBC Masters as an amateur...Owns seven PBA regional titles. 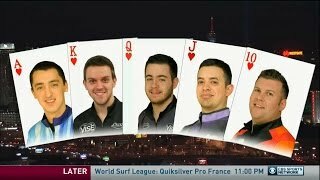 2016 - U.S. Open Las Vegas. Won 2017 World Bowling Championship Masters gold medal...2016 Harry Golden Rookie of the Year...2016 Southwest Region Rookie of the Year. 2018 Southwest Region Player of the Year...Won silver medal in 2017 World Games doubles with Dan MacLelland...Four-time member of adult Team Canada…Won 2015 Pan Am Games doubles gold medal with partner Dan MacLelland…Won 2013 World Bowling Championships trios gold medal with Mark Buffa and Patrick Girard…Won 2014 Intercollegiate Singles Championship and 2015 Intercollegiate Team Championship with Wichita State.